Sweden is a land of trees. More than 70% of its landscape is covered by forest and in less than 100 years, Sweden’s forest assets have doubled. Yet this is also a country where chopping down trees is big business. Sweden holds just under 1% of the world’s commercial forest areas and provides 10% of the sawn timber, pulp and paper that is traded on the global market. Far from being a logged wasteland, however, Sweden has more forest now than it did a century ago – when it had only a fraction of its current population and globalisation didn’t exist. 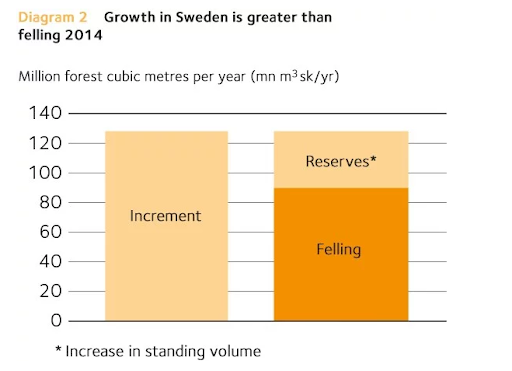 So, how has Sweden managed to grow its timber industry as well as its level of tree cover? The simple answer is that Sweden grows more trees than it chops down. Annual growth stands at around 120 million forest cubic metres, and each year around 90 million forest cubic metres of that growth is harvested. That’s because Sweden employs a sustainable forestry model. After decades of decline in Sweden’s forest in the 19th century, caused by farming, housing construction, wood for fuel, charcoal for the iron industry, and later as a source of logs for timber and pulping, the first Forestry Act was passed in 1903 with the intention of reversing the decline. Since then, for every tree that was chopped down, another had to be planted. In addition, the legislation also limited the amount of timber that could be harvested. 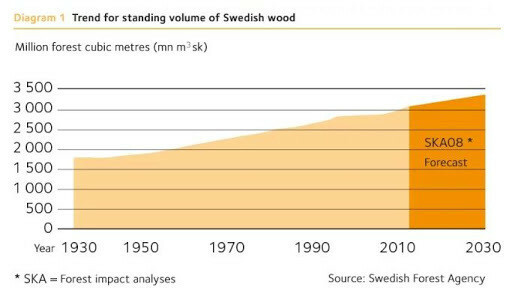 While Sweden recognises the importance of wood to its national economy – the forestry industry employs over 60,000 people directly and is indirectly responsible for around 200,000 jobs – the government wanted to make sure that commercial timber production and forest biodiversity were given equal importance. In 1993, Sweden made its forests “a national resource”, making sure that the industry was both economically, socially and environmentally sustainable. Despite all the positive statistics, Sweden’s forestry policies and timber industry are not without their critics. As forest cover is increasing, the levels of biodiversity appear to be reducing. Almost all the forest in Sweden can be defined as cultured forest, which means forest that is cultivated and managed. Only the northernmost mountain regions have areas of virgin forest, areas that have not been affected by agriculture or silviculture. According to the Swedish Society for Nature Conservation, Sweden’s model means that ancient or old growth forests are disappearing, replaced by clear-cutting, where all trees in an area are felled, to be replaced with monoculture tree plantations, where all the trees are of the same species. This has an impact on biodiversity, and even threatens some species with extinction. 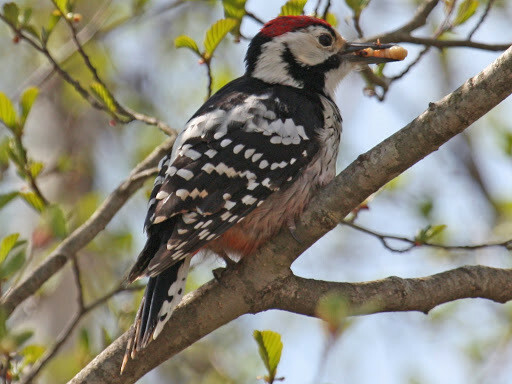 Due to the lack of forests with old or dead deciduous trees, the white-backed woodpecker is under threat. The Society says that Sweden needs to increase the proportion of protected forest from 4% to 10% and to take measures to protect all ancient old growth forests in Sweden. But Sweden’s forests are also under threat from climate change. With a warming climate, outbreaks of new types of pests are likely, and the increase in the frequency of storms and droughts will also impact the forests. Trees are a critical resource in the fight against climate change. 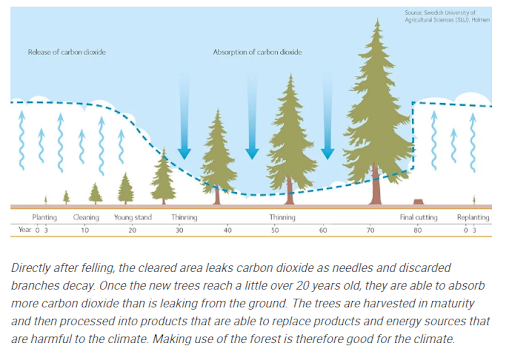 The Paris Agreement recognizes that forests play an important role in meeting climate goals by removing carbon dioxide from the atmosphere and storing carbon in trees and soils. In an effort to reduce the amount of carbon dioxide in the air, countries around the world are planting trees. Earlier this year, Pakistan hit its target of planting 1 billion trees in an effort to restore depleted forests and fight the effects of climate change. China has enlisted the help of its army to plant trees to create new forests. Forests are also important for biodiversity, and billions of people rely on forests for their food, work and shelter. They have a positive impact on health and wellbeing too. Studies show that living near a forest can help reduce people’s stress levels. In Sweden, spending time in forests is one of the most popular leisure activities.